Mmmm. Dippable, gooey, low-carb mozza sticks. warning: this is a messy recipe! beware. The amount of ingredients I use for this recipe sometimes fluctuates. Sometimes I'll decide to dunk and coat the sticks more than usual so I obviously end up using more, but this is a good starting point and is what the nutritional value is based on. If you run out of, say, your "breading", it is super simple to make a bit more. 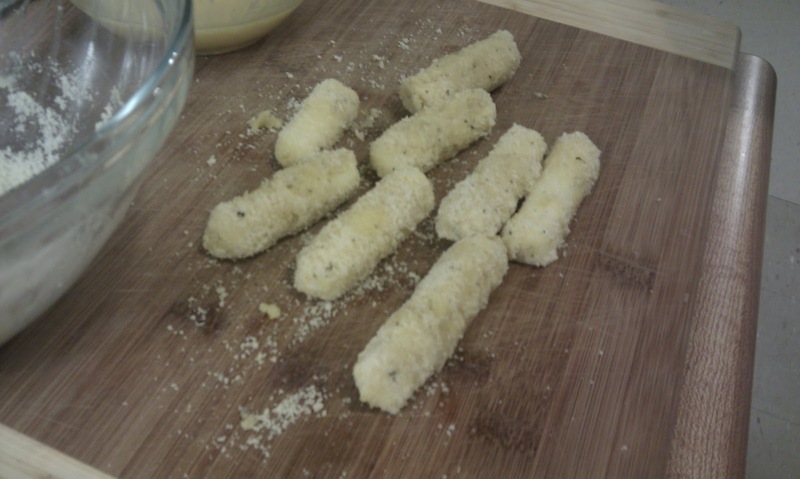 * The cheese sticks MUST be frozen before you begin the process of dunking and coating. You can cut them in half before you freeze them, or when they are frozen. ** If you don't have almond flour you could try it with flaxmeal, or peanut flour. I haven't made mozza sticks with either of those flours but there is no harm in trying. Beat your egg in one bowl. 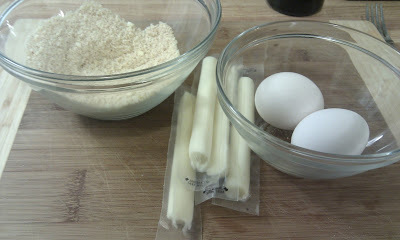 In another bowl, mix your dry ingredients (the "breading"). 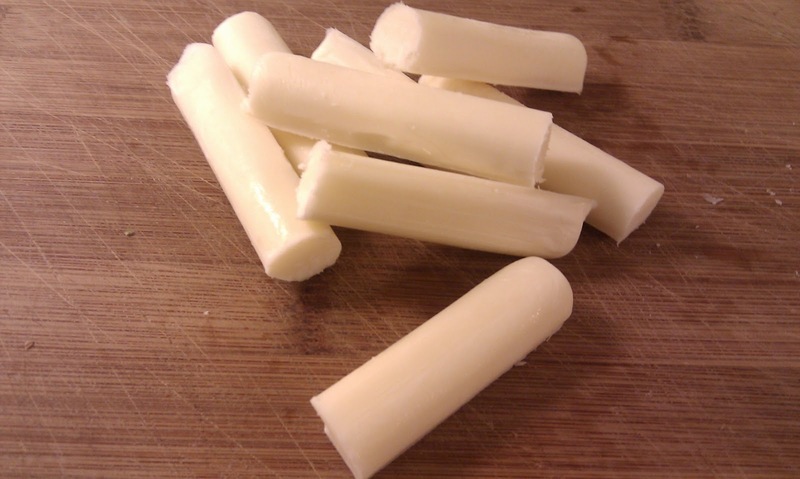 Remove cheese sticks from the freezer. If they are not already cut in half, do so now. Try to do it quickly (but don't hurt yourself) as the cheese will actually thaw pretty quickly. We want the cheese sticks to still be frozen when we fry them. Now that all your cheese sticks are ready (you should have 8 halves), you can begin the process of dunking and coating your sticks. * I find that the extra dunk in egg helps "seal" the stick while cooking. It isn't necessary, so don't fret if you don't have enough egg left. 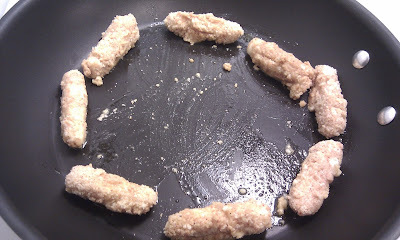 tip: If, after the second dunk, you gently roll the sticks between your palms (pressing the breading together), it helps make the sticks sturdier when cooking. However this is not necessary and is easy to mess up. Preheat your pan on medium-low for a short while (you can check if it's heated by sprinkling a drop of water on it. If it sizzles, you're good). Place all sticks on the pan and increase heat to medium or medium-high. We want to cook the sticks quickly so they don't melt out of the breading too much*. Use your tongs to turn the sticks every minute or so. 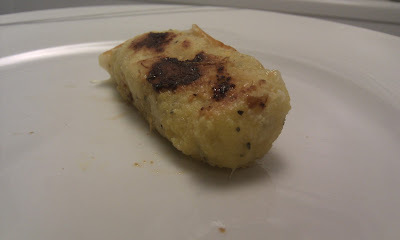 Continue frying each side until the sticks are a nice, crispy golden brown. *No matter how many times I make this, I always end up with one or two mozza puddles. They still taste delicious. Place all sticks on a plate and serve with your favourite low-carb dipping sauce. I actually use a low-carb pizza sauce with some Franks Red in it. I know all the pics I take are low-quality. I take them on my phone and I don't care much about lighting. I just want you guys to be able to see what I've been doing!